(Photo: REUTERS / Navesh Chitrakar)Tibetan monks carry the portrait of exiled spiritual leader Dalai Lama during his 79th birthday celebrations in Kathmandu July 6, 2014. Nepal ceased issuing refugee papers to Tibetans in 1989 and recognises Tibet to be a part of China. The Dalai Lama, a personal friend of Desmond Tutu, has again been refused entry to South Africa, where he was scheduled to attend the 14th world summit of Nobel peace laureates, his representative has said. "We have informally received contact His Holiness won't get his visa," Nangsa Chodon, the Dalai Lama's South Africa-based representative, told Reuters news agency on Thursday. The Tibetan Buddhist leader has twice previously failed to secure a visa to visit South Africa. The first time was in 2009 when he tried to attend a Peace Summit, South Africa's Business Day newspaper reported. In 2011 he applied for a visa to visit South Africa to attend Bishop Emeritus Desmond Tutu's 80th birthday celebrations. He voluntarily withdrew it after the South African government had been accused of declining it due to pressure exerted on it by the Chinese government. After the second debacle, Tutu said: ''We will pray, as we prayed for the downfall of [the] apartheid government, we will pray for [the] downfall of a government that misrepresents us." Tutu was said to be out of South Africa on Thursday and could not be reached for comment. The outcry generated over that incident caused the opposition Inkatha Freedom Party and the United Democratic Movement to take the South African government to court. In 2012 the Supreme Court of Appeals ruled that the South African government was wrong in refusing a visa without giving reasons to the applicant. The South Africa government was forced into damage control mode as outrage mounted over its apparent intention to deny the Dalai Lama a visa for the third time in five years to avoid upsetting China, reported Times Live on Friday. "The Nelson Mandela Foundation, the FW de Klerk Foundation and opposition political parties had piled on the pressure to ensure that, this time round, the Tibetan spiritual leader and long a thorn in Beijing's side, would be able to visit South Africa. It then emerged that he had withdrawn his application." He had been invited to next month's World Summit of Nobel Peace Laureates in Cape Town. After reports that the Nobel laureate would be denied a visa, the Department of International Relations and Cooperation said the Dalai Lama's application had not been rejected and that it would receive a fair assessment. The department later said it had received "written confirmation" from the Dalai Lama that he had cancelled his planned visit. But his representative in Pretoria, Nangsa Choedon, told Cape Talk radio yesterday she was called by a foreign ministry officer who said the government could not grant him a visa. "The main reason they said is [that it is] in the national interest that they cannot grant a visa to his holiness because that would disturb relations between China and South Africa," said Choedon. South Africa's International Relations and Cooperation spokesman Clayson Monyela yesterday denied that the Dalai Lama had been advised against travelling to South Africa. "I am not going to answer what the other people are saying ... that's my statement," said Monyela. The drama unfolded as International Relations Minister Maite Nkoana-Mashabane undertook an official trip to China. China is South Africa's biggest bilateral trading partner, having overtaken the United States four years ago. Official data shows South Africa imported 154-billion South African rands worth ($14.3 billion) of goods from China last year, and exports were worth 116-billion rands. 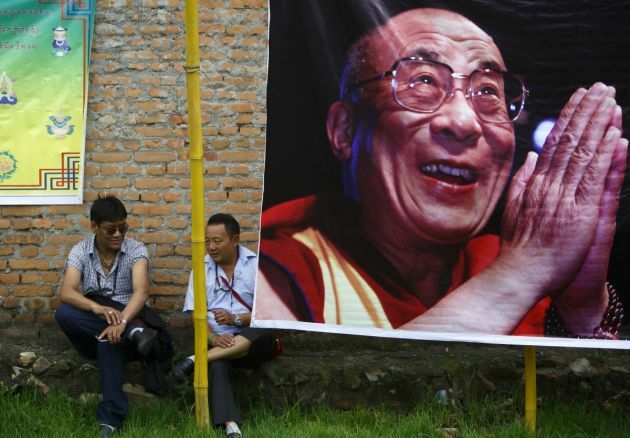 South Africa's opposition Democratic Alliance denounced Pretoria's treatment of the Dalai Lama. ''The Dalai Lama does not deserve to be treated like a persona non grata, especially when he poses no credible threat to South Africa," said DA international relations spokesman Stevens Mokgalapa. The Cape Town summit is expected to be attended by 1,500 guests, including fellow Nobel Peace Prize laureates. The City of Cape Town and the Nelson Mandela, FW de Klerk, Desmond and Leah Tutu, and Chief Albert Luthuli foundations are the hosts. The foundations who represent South Africa's four Nobel Peace laureates initially had said they would appeal directly to President Jacob Zuma to ensure the Dalai Lama was granted a visa. Political analyst Mcebisi Ndletyana said South Africa is a "timid" trading partner that sometimes kowtows to China to protect trade relations, Times Live reported. ''It would seem like South Africa is a bit cautious or rather a timid partner in all this. They don't want to upset the Chinese. The Indians seem to be very assertive about their own choices [in their dealings with China], they won't be dictated to ... we have to make our choices ourselves," he said.